When the most classic wedding band styles meets diamond, the symbol of eternal love, a ring that truly last forever is created. Unlike similar rings made in white gold or platinum, cobalt chrome is much harder and more scratch resistant. Most importantly, it will never tarnish or change color, which means it never requires re-plating of rhodium. The ring is finish in glossy high polish finish with comfort fit design on the inside. The genuine, untreated solitaire diamond is set on the ring with a secure flush bezel setting. Being made in cobalt chrome, this ring will not bend out of round like gold or silver rings, and because of that, the diamond is not going to fall out of the setting. 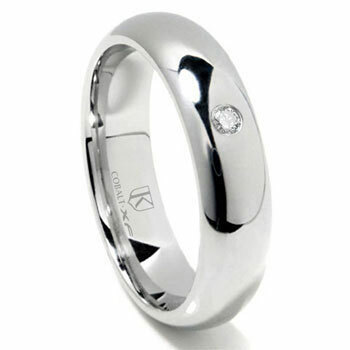 This is a truly maintenance free diamond ring at a fraction of the price of similar ring made in white gold and platinum.